Police seized over 7,000 grams of synthetic cannabis, above, from an Illinois man charged with selling tainted drugs that killed at least one person. Illinois police have made the first arrests in connection to an ongoing outbreak of synthetic cannabinoid products responsible for hundreds of severe bleeding cases and at least three deaths. One person, who allegedly distributed the drugs, has been charged with homicide. Late last week, Pekin Police Department officials in Tazewell County, Illinois, announced they had arrested and charged 46-year-old Lonnie K. Smith with the drug-induced homicide of 47-year-old Anthony Phillips, as well as the unlawful possession of a controlled substance with intent to deliver. Two other individuals—Rachel Spires, 30, and Richard Booth, 26—were also arrested and charged with aggravated battery and delivery or possession with intent to deliver. All three appeared in Tazwell County Court Friday and had their bonds set. “The distribution of these illegal drugs represent an unacceptable risk to public safety, and dealers must be held criminally responsible for their conduct. I wish to recognize the swift and effective investigation by the Pekin Police Department,” Tazewell County State’s Attorney Stu Umholtz told NBC affiliate 25 News. Prosecutors allege that Smith sold synthetic cannabinoids to both Anthony Phillips and his girlfriend on April 7. In the middle of the morning the next day, Phillips woke up vomiting blood and felt severe stomach pain, while his girlfriend also experienced symptoms. Both were hospitalized, and Phillips died on April 9. Prosecutors said the woman told Pekin police that Smith was Phillips’ regular dealer. When police visited Smith, he reportedly confessed that he sold K2—one of the many product names under which synthetic cannabinoids are sold—and that he dumped the rest of his supply in a nearby dumpster. 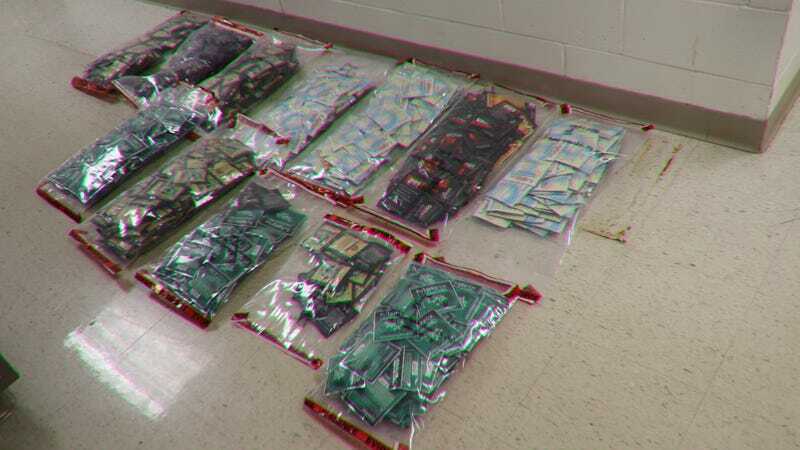 According to a statement by the Pekin Police Department, officers found 3,500 packets of K2 in the dumpster, or more than 7,000 grams of the drug. Lab testing revealed that the K2 found contained FUB-AMB, a synthetic cannabinoid that the DEA recently and temporarily classified as an illegal Schedule I controlled substance (the same category that covers drugs like heroin). Spires and Booth are also alleged to have sold products containing FUB-AMB that resulted in severe hemorrhaging among numerous people. Even before this outbreak, FUB-AMB has caused dangerous complications. Meant to mimic the high of traditional cannabis, it’s many times more potent. It was behind an outbreak of “zombielike” behavior that struck 33 people in a Brooklyn neighborhood in 2016, 18 of whom were hospitalized. It’s also believed to have contributed directly to at least one death. Synthetic cannabinoids in general have been associated with temporary psychosis, hallucinations, and cardiovascular problems. The current outbreak of “synthetic cannabinoid-associated coagulopathy” cases, in which people have bled from their ears and eyes after injesting the drugs, is thought to be caused by products laced with rat poison. But it’s unknown at this time how the contamination occurred in the first place, or whether it was intentional. Pekin police stated that no further information will be released at this time, citing an ongoing investigation. And the Tazewell County State Attorney’s Office has not immediately responded to a request for a comment. According to the Illinois Department of Public Health, as of Monday there have been 131 cases within the state, which is thought to be the epicenter of the outbreak. Isolated cases have been seen in four other states, however, according to the CDC: Indiana, Maryland, Missouri, and Wisconsin. Anyone who experiences unexplained bruising, or bleeding from the ears, nose, gums, or ears, or heavy bleeding during a period, after taking these products should seek immediate medical help by having someone take you to the hospital or by calling 911.